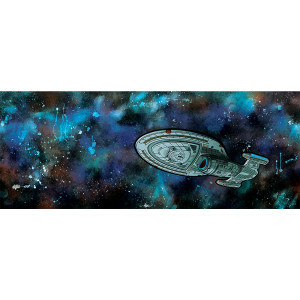 At 3 feet wide, this print, of the Intrepid class USS Voyager, is awash in color and expression. The image is achieved through an innovative technique of, what some may call, reverse painting. Artist Charity Wood begins her paintings on a black canvas, and paints everywhere except the "black lines." This way, the lines aren't placed on at the end as you would normally think of "outlines," but rather, you are seeing the unpainted original black canvas showing through. It's a meditative process of protecting the areas that need to stay black yet letting loose the expressive brush strokes that are necessary for the energetic color and striking background. Entitled “Intrepid Class,” this new print fits well with the other ships in artist Charity Wood’s series. This piece portrays the long-traveled ship as it flies through unknown territory on its journey to reach home. Her signature use of paint splatters, bold color, and inverse linework add to the energetic feel of this leg of the USS Voyager’s trip home. By artist Charity Wood from Bye Bye Robot.